The main complaint of homeowners in Arizona is high electric bills or air quality issues. One of the biggest culprits of these issues could be leaky air ducts. Air ducts should operate in a closed system because they are in charge of moving cooled or heated air around a home to keep us comfortable any time of the year. But if there is a hole or leak within the ductwork anywhere, the efficiency of the entire house could be in jeopardy and contaminants may enter into the air through these insufficiencies. High energy bills that are due to an HVAC system constantly running to heat or cool a home. HVAC system isn’t running efficiently, often needing many repairs and there are still inconsistent room temperatures. Air quality issues especially after turning on a heating or air conditioning system. Air filters become filthy rapidly from all the dust and allergens being blown into the air. The AZ Energy Efficient Home team checks for air duct inefficiencies and possible air hazards throughout the living space in a home and attic during our energy efficiency assessments. We test the current duct system for dust and particles that an HVAC system may be sucking in through leaky ducts, blowing into the breathable air in a home. We make sure that all joints and seams are sealed and that the duct fittings are intact. 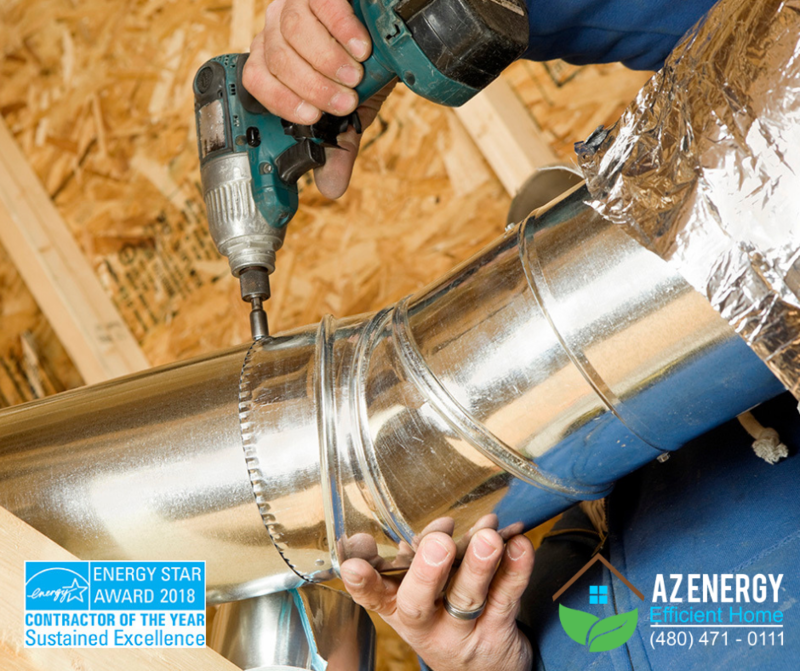 The AZEEH team is a recognized Preferred Home Performance contractor for APS and SRP so we are qualified to complete the necessary repairs to improve duct sealing in Arizona homes. One of the biggest differences when it comes to reducing energy consumption in a home is to fix leaky air ducts. Schedule a time for a home energy efficiency audit with AZ Energy Efficient Home to ensure a safe, healthy, and comfortable environment for your holiday guests this year.